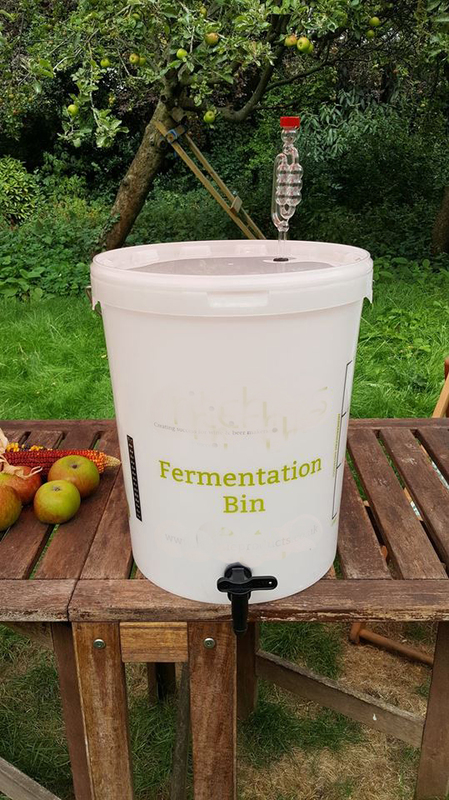 Recently I bought 25L fermentation bucket with airlock, thermometer and a tap. Originally, I was going to ferment some vegetables with chillies but decided I would like to make apple cider vinegar in it instead. I have lots of apples (see the background) which are quite sour and other than cooking, I don't know what else to do with them. I'm actually looking for ideas as well as advice on weather this bucket is suitable for ACV at all? If its food grade then its fine. Their are several threads on making Vinegar. I'd be thinking of mixing them with some sweeter apples to balance them out and ferment a hard cider. Your bucket would allow you to pour into secondary off the yeast cake without having to siphon. The sour apples would be the smaller part of the mix though, maybe 1/3 or so. I'd also be thinking ACV just like you are. I think the easiest for me is to go ACV route and forget about hard cider*. I'll just wash the apples, juice them and mix juice and pulp together in the bucket and leave it few months to slowly turn to ACV. *hard cider = American for alcoholic cider if I'm not mistaken? In UK a cider is always alcoholic, otherwise is just an apple juice. If I wanted to make vinegar, I would juice those apples, and pitch a high alcohol, fast acting wine yeast, like EC-1118. That will eat all the sugar super fast, and prevent the juice/must from getting contaminated. Then, I would pitch a healthy culture of acetobacter, and let all of that alcohol become converted to acetic acid, AKA vinegar. Yep. "Cider" is just cloudy/unfiltered apple juice around here, Takes "hard" to = alcohol. Also "cider" to many in the US means the spiced ciders around the Holidays. +1 Nottingham is great for cider, though it took me a while before I started using it. I use RS Montrachet mostly, which I particularly like for a good dry Apfelwein. Man, all this talk will have me headed out to my local orchard soon to pick up some fresh pressed juice. I've ordered EC-1118, that was easy enough. I shall add it to the juice/must and leave it for how long before checking? At what point it should become hard cider and how do I know? Then I could bottle some of it for second fermentation/ageing if it turns alright. The rest I should contaminate with acetobacter (the mother?) which will turn it to vinegar. Sorry if questions are silly. 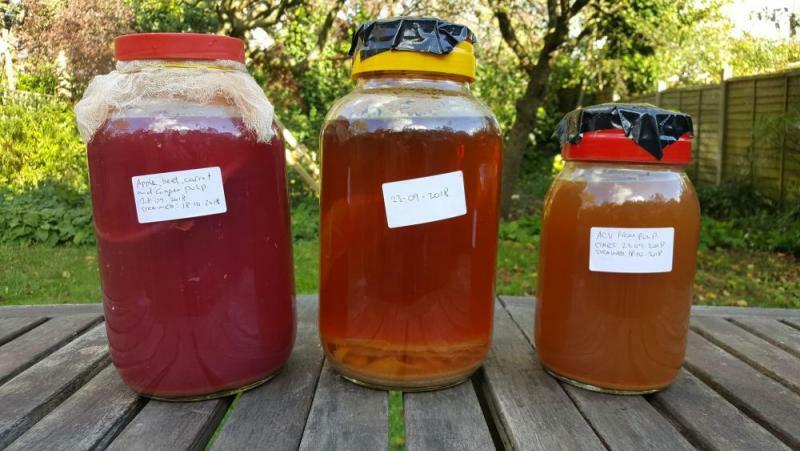 I've made vinegar before but that was just letting juice/must ferment in a regular bucket, on it's own, with only a help from many a fruit flies. Thanks all for your help, it's very useful. I washed and cleaned lots of apples and juiced them. I used both juice and pulp. 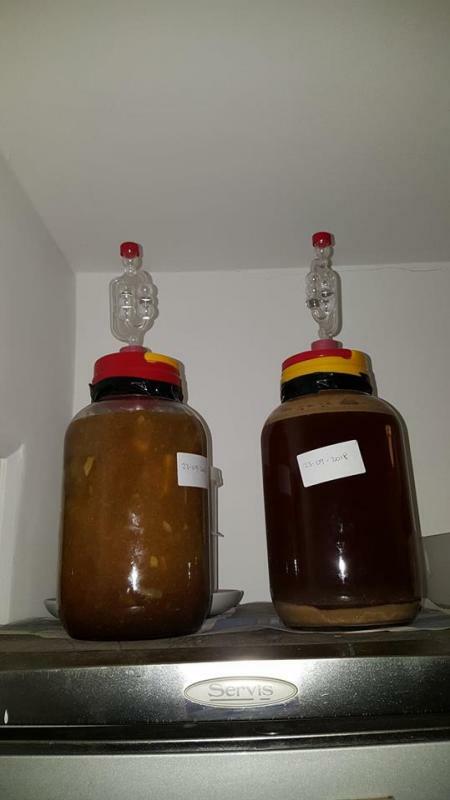 Pulp is in the jar on the left, juice on the right. I've added about 150g of dark muscavado sugar and couple of tbs of raw organic ACV with the mother in each jar. I topped pulp with water as it was too dry as is. I know I don't need air locks but are they hindrance? Should I remove them and put a peace of cheese cloth over the hole to let the air in? If your going to make vinegar, it needs oxygen, so a mesh/cheese cloth is required to cap it, it has to be able to breath. Yes, but airlocks look so scientific and like I know what I'm doing. I'll take them off tomorrow. I've removed airlocks and it came alive. I had to take some pulp out as it was pouring out like a volcano. 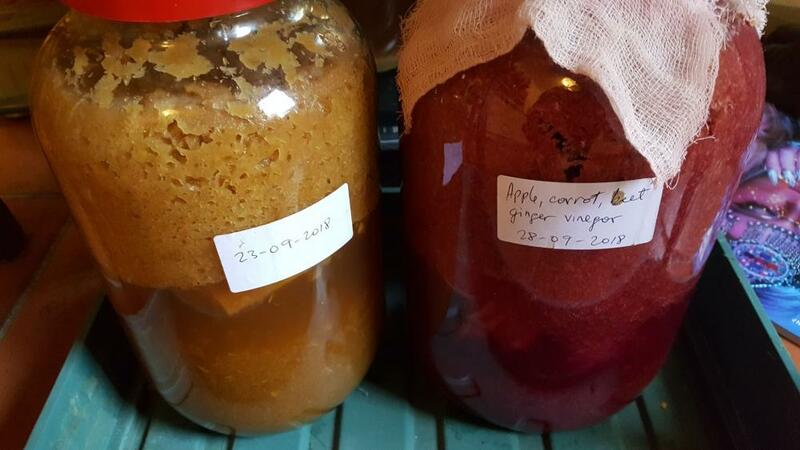 I also made another batch with the scraps of the yesterday juice we made with apples, beets, carrots and ginger. Couldn't bring myself to compost it and I'm turning that into vinegar too. I should have about 10L out of this after straining. All this talk of home-brewed vinegar has me wanting to take a shot at making my own. It sounds like a perfect winter project. But, for the life of me, I can't find any dedicated threads on the subject. Can someone please point me in the right direction, with links? Their are several threads in this section on that. Basically make wine and add Vinegar culture and don't go over 7% alcohol. As soon as the Cranberries are in at costco will be making a bucket of Cranberry Vinegar. Edited by dragonsfire, 29 September 2018 - 02:01 PM. Apple juice vinegar is developing nicely. I believe this it the mother forming on the top. This jar is just pure pressed apple juice with couple of spoons of brown sugar as the apples themselves were very tart. 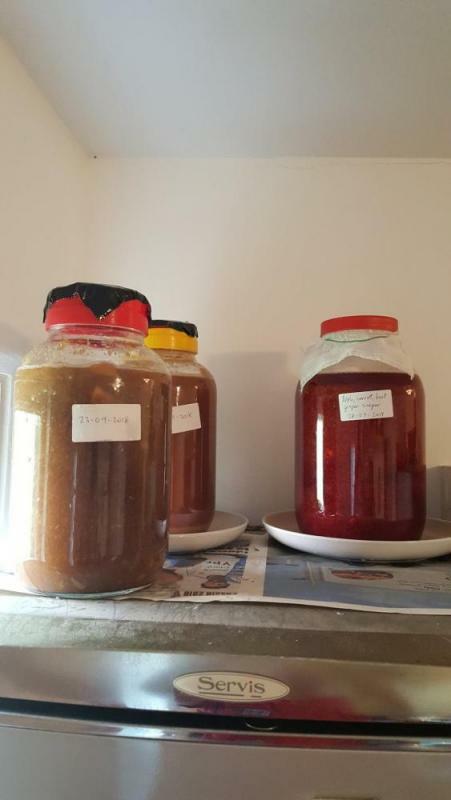 Other two are doing fine as well, apple pulp (on the left) will strain at the end of the week and beetroot/carrot/apple (RHS) will leave for another couple of weeks. I stir them every day to stop mould from taking hold on top. I strained them some time ago and they are developing nicely. 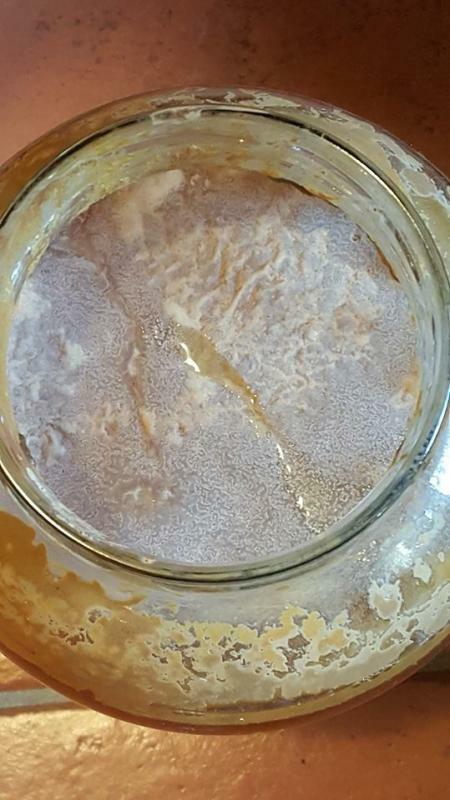 Nice vinegary smell and the mother is in every jar. Does anyone know what would be the next step? 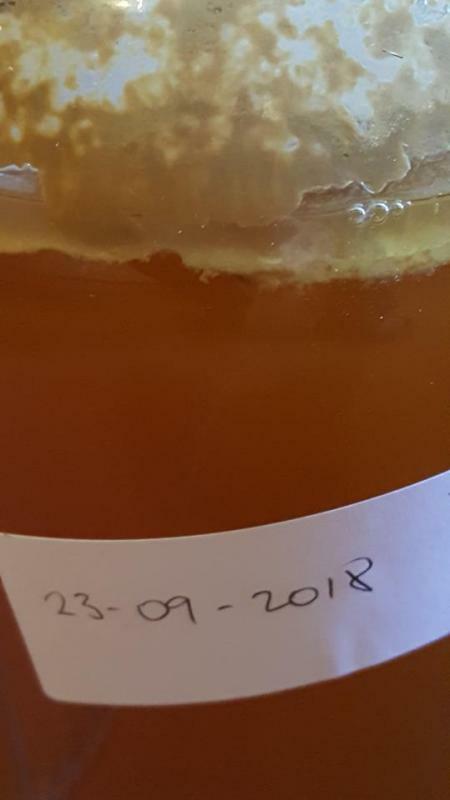 I guess I need to strain the mother and bottle it but how to I know when is the best time? I haven't tasted it yet, maybe I should? I just had a little slurp of each and they are very tasty but not ready yet. All three have that vinegary zing and their fruity character but still not enough acidity to use as a salad dressing or anything else. Well, maybe adding a bit of sugar or honey to a shot of it and diluted with some water would make a nice refreshing beverage. Beetrooty one tastes unmistakebly of beets and carrots. Lovely stuff. Its trial and error depending on the alcohol content etc.. mine is taking forever it seams since the alcohol is a bit high and slows down the process. Dont rush it, its worth the time. I'm not rushing it and even if I wanted to, I wouldn't know how. I have been adding sugar to it couple of times and that might have spiked alcohol content a bit. The clear one in the middle jar which is pure pressed apple juice is still quite sweet. All of them will be very nice, I'm sure. Edited by Honey Badger, 03 November 2018 - 10:06 AM.